(BS) side (Table 1; Figure 2) (Ravosa et al., 2000a,b).2 Observed differences in WS/BS postorbital bar shear strain ratios mirror WS/BS variation in mandibular corpus strain ratios (Table 1). This appears due to the fact that galagos recruit relatively low levels of BS jaw-adductor force (Hylander, 1979a,b; Hylander et al., 1998, 2000, 2004; Ravosa et al., 2000a,b; Vinyard et al., this volume). As left- and right-sided powerful chews are equivalent for the dorsal interorbit, galagos exhibit a mean peak shear strain of 420 |J£ during forceful molar biting and chewing (Table 1; Figures 2 and 3)(Ravosa et al., 2000a,b). Lastly, interorbital and WS postorbital bar strains are of similar magnitude and peak values for both sites are significantly lower than the mean peak shear strain of 1197 |J£ for the WS corpus during mastication (Table 1; Figures 2 and 3). 2 Procedures for bonding three-element 120-ohm stacked delta-rosette gages, for recording bone strain, and for analyzing cranial strain data are detailed elsewhere (Hylander, 1979a; Hylander et al., 1991a,b, 1998). Seven ACUC-approved experiments were performed on three adult male greater galagos, such that each was used more than once (Ravosa et al., 2000b). In all cases, an attempt was made to align the A element of each rosette the following way: dorsal interorbit - along the midsagittal plane, postorbital bar - along the bar's long axis, and mandibular corpus - parallel to its long axis. Chewing side during mastication of tough/hard foods (prune nut, dried prune, dried apricot, dried gummi bear) was identified via monitoring of surface electromyograms (EMGs) for both superficial masseters, i.e., WS EMG is relatively higher than BS EMG (Hylander et al., 2000). Figure 2. 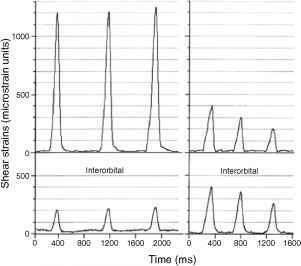 Plot of peak shear strains recorded simultaneously from the dorsal interorbit and left postorbital bar of a greater galago during powerful mastication on both sides of the face (Ravosa et al., 2000b) (Table 1). Postorbital bar strains for left-sided chews (working side) are much higher than right-sided chews (balancing side). Due to the midsagittal location of the dorsal interorbital gage, such strains are similar in level regardless of chewing side. Interorbital and WS postorbital bar strains are also similar in peak magnitude. 1988a,b; Lahr and Wright, 1996; Oyen et al., 1979; Rak, 1983; Rangel et al., 1985; Russell, 1985; Tattersall, 1995; Wolpoff, 1996). Figure 3. 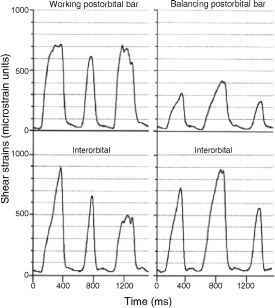 Plot of peak shear strains recorded simultaneously from the dorsal interorbit and right mandibular corpus during forceful unilateral mastication (Ravosa et al., 2000b) (Table 1). Corpus strains for right-sided (WS) chews are much higher than left-sided (BS) chews, while interorbital strains are similar in magnitude regardless of chewing side. Interorbital strains are considerably lower than WS corpus strains, which indicates a significant strain gradient along the facial skull. is correct to base estimates of safety factors on the fact that cortical bone undergoes monotonic yield failure at 6800 |ie or fatigue failure at 3000 |i£ (following 106 loading cycles - Currey, 1984). However, in analyses of the circumorbital region, it seems more appropriate to estimate safety factors based on the fact that cortical bone experiences ultimate failure at 16,000 |ie—a load indicative of the magnitude required for an accidental or traumatic force to significantly reduce the fitness of an individual (Hylander and Johnson, 1997a,b; Ravosa et al., 2000b,d). This variation also suggests that epigenetic and genetic control of craniofacial form results in circumorbital and neurocranial safety factors for traumatic loads, and thus safety factors for masticatory stresses significantly higher (10-20 times) than for elements such as the mandible, anterior root of the zygoma and zygomatic arch. 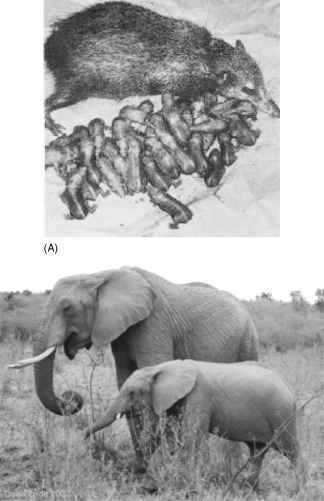 A similar pattern is observed in comparisons of rat ulnar strains (large in magnitude) during locomotion with rat calvarial strains (low in magnitude) during biting and chewing (Rawlinson et al., 1995).